Custom Imprinted Kapalua Sunglasses have an overall size of 6"l x 6"w x 2"h and are featuring UV400 lenses. These lenses are capable of delivering 100 percent UVA and UVB protection to the eyes, thus making it a cool experience for everyone to be in the sun during activities or events. Orange, Black, Blue and Green are the color choices available for these customizable Oahu sunglasses presented in a trendy unisex design. Manufactured from durable polycarbonate material, they fit most head sizes. 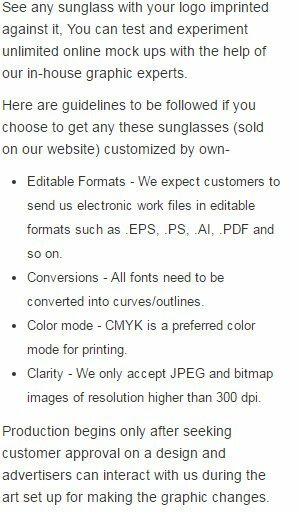 Order these custom new arrival sunglasses right now to gain free online proofs, free design and lowest price guarantee offers. Request a quote to know price cuts that you can avail for wholesale Custom Imprinted Kapalua Sunglasses. Features: Lense are UV400 to provide 100 percent UVA/UVB protection, Trendy unisex design.